While most campervan rentals in Australia do not include WiFi (unless you rent a motorhome with toilet and shower), there should be plenty of opportunities to get online while you are on the road. You will find WiFi hotspots at campgrounds, cafes, and other public places. On these networks, you will have a chance to plan your route, check the weather and more. There are a number of apps which can bring this information straight to your fingertips while you are on your trip. Here are 5 apps which you should download before you head out on your campervan vacation! If you are going to download just one app for your smartphone or table for a vacation in Australia, this should be it! While you need to be connected to the internet to download the app or update it, you can use it offline. So even if you are nowhere near a WiFi connection or a cell phone signal, you will be able to search through all the information in the database. You can also look at the map and plan routes with ease. A simple “Get Directions” button will guide you to your destination. 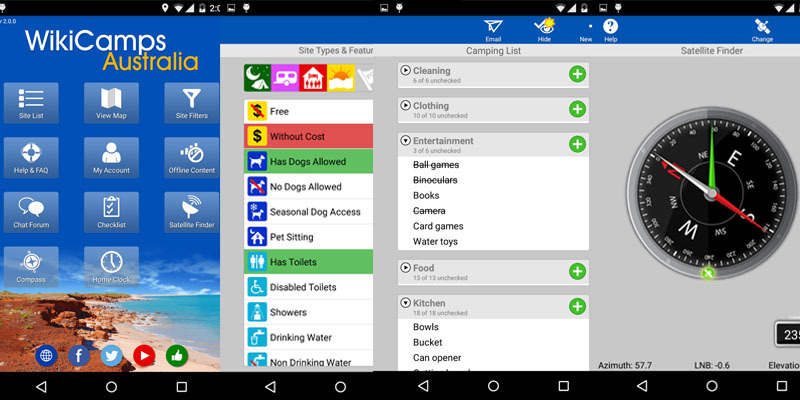 This app is compatible with Android, iOS and Windows systems. You can try the app for free (the free version is ad-supported), and then upgrade when you are ready for one low fee. This is another excellent navigational aid which works when you are offline. When you download the app, the full set of maps is also downloaded to your device and stored directly on your smartphone or tablet. Features include driving view on 3D street-level maps, clear voice directions, and trip planning supporting up to 3 routes and 52 stops. Because the database includes restaurants, service stations, campsites and more, you can easily figure out where to stop to rest or get a bite to eat, even if you still are out of range of a WiFi connection or cell signal. Have trouble figuring out your lane at a crowded intersection? So you never miss that crucial turn, ClearTurn™ visuals help you to stay on course for your destination. Meanwhile, Active Traffic provides you with real-time traffic updates so you know what to expect on the road ahead. 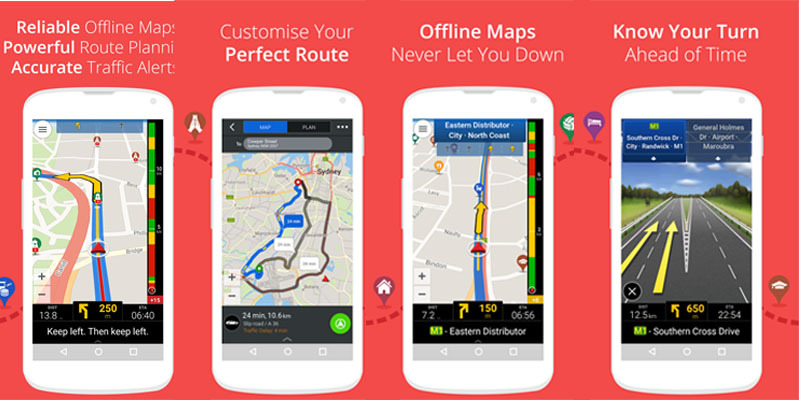 You can use CoPilot GPS on your Android or iOS device. You are allowed to download the map for any one country or region for free. If you want additional maps, you need to purchase them inside the app. You are coming up on a large town, and you know you need to fuel up before you head back out into the desolate expanses of Australia’s Outback. But where should you stop for petrol? Trying to find the lowest prices by driving around and checking the signs is a real pain, especially if you are dealing with complicated intersections and rush hour traffic. But if you download the MotorMouth app, you can receive location-based data on stations nearby delivered right to your mobile device. Furthermore, you can check forecasts for likely prices in the near future. This app is entirely free for iOS and Android systems. Nothing can put a damper on a road trip faster than bad weather. Wouldn’t it be great if you had a handy app which would keep you apprised of meteorological conditions during your trip? 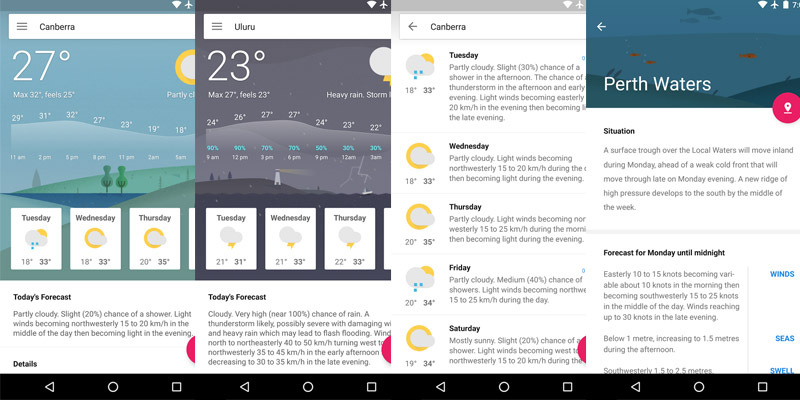 There are a number of weather apps out there which you can download for your mobile device, but one popular and highly rated one to consider is Aus Weather. This app provides you with data on tens of thousands of locations. View 7-day forecasts with hourly updates, and even check out historical data, marine forecasts, and radars and maps. Aus Weather will keep you up-to-date on precipitation, wind speed and direction, and hazardous conditions. Set it up to receive notifications, warnings and alerts, and you will stay safe on the road during your campervan vacation. You can download Aus Weather for your iOS or Android device. The program is free and ad-supported. This free app is your best friend if you are planning on exploring Australia’s beautiful national parks and wildlife reserves. 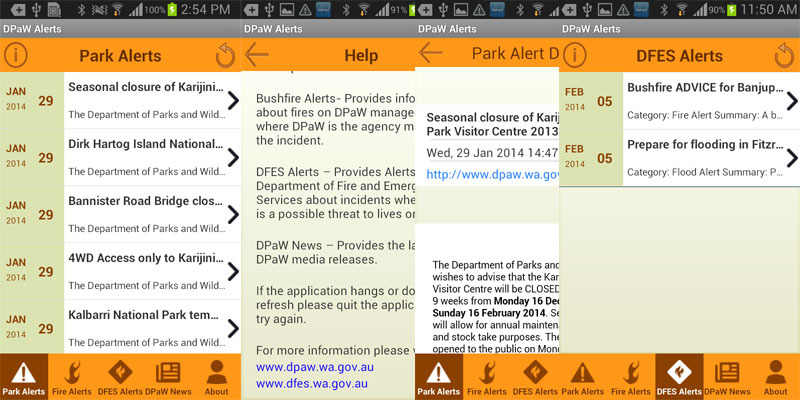 The Department of Parks and Wildlife use this app to send out Park Alerts—seasonal closures, road closures, trail closures, reports on 4WD road conditions, bushfires, and so on. These real-time alerts can be invaluable to you when you are driving. There is no faster or easier way to check the conditions before you go driving on a 4WD track—many of which become un-drivable during certain seasons and weather conditions. Parks and Wildlife Alerts can keep you safe, and also prevent you from wasting your time when it might be better to reroute your trip or plan a different set of activities in the park you will be visiting. Now you know 5 of the top apps to download for your smartphone or tablet before you head out in your campervan to explore beautiful Australia. With these apps on your side, you will enjoy a safe, smooth, economical vacation!